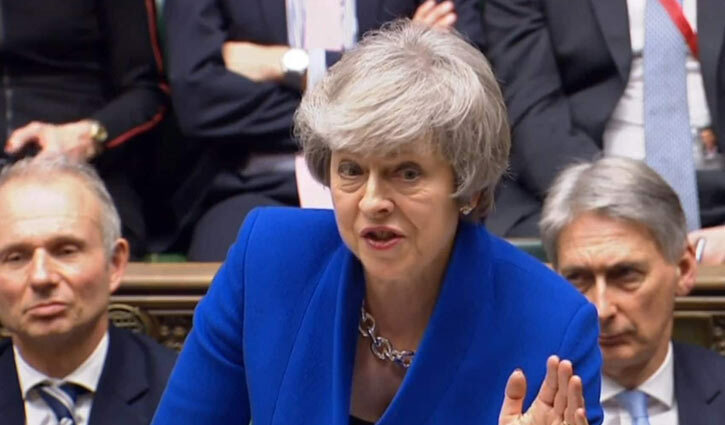 International Desk: UK Prime Minister Theresa May has seen off a bid to remove her government from power, winning a no-confidence vote by 325 to 306. Rebel Tory MPs and the DUP - who 24 hours earlier rejected the PM's Brexit plan by a huge margin - voted to keep her in Downing Street. Labour leader Jeremy Corbyn argued that Mrs May's "zombie" administration had lost the right to govern. Mrs May will be making a statement from Downing Street at around 22:00 GMT. The PM won the vote by a margin of 19, including 10 votes from the DUP. Had the party voted against her, she would have lost by one. She invited leaders of all parties to have individual meetings with her on the way ahead for Brexit - starting tonight with offers made to the Westminster leaders of Labour, the Liberal Democrats, the SNP and Plaid Cymru - but called on them to approach them with a "constructive spirit".